I am spoiled. I am spoiled by Addi Turbos. I should have expected it from reading about everyone's experiences with Addi Turbo circular needles and finding out for myself in the short time I've been sock and otherwise knitting circularly. But what's a knitter who needs a 2.75 mm needles to do? Addi doesn't make needles in that diameter, but Yarn Cubby does, with a clever elastic cord between the the pins. A brillian idea, I thought at first, and rushed to buy whatever length I could find. Last night was the moment of truth as I casted on for a new pair of socks using my lovely and now discontinued Sundara Meridian sport merino wool. The Lilacs pattern by Jeanie Townsend (check out her blog, Just Jeanie, to see the pattern; there's a link on my list) calls for more stitches around, so I figured I should go down from a 3 mm to a 2.75 mm, and I still don't have a 2.5 mm set of circulars (whatever was I thinking? I have 2 mm but not 2.5 mm??). Anyway, I casted on using the tubular cast-on I like so much from the Embossed Leaves pattern - and the yarn does not slide nicely from cord to pin. Not at all. The pins are not tapered down to the cord, so there is not as smooth a join as the Addis have. The elastic cord is kind of grabby, and the plating on the pins has more a sand-blasted or matte finish, rather than a smooth finish, so yarn does not glide along but has to be pushed along. I don't mind the pin part; I live in fear of losing sts on the Addis; sometime I think they are too smooth for some yarns. But these stretchy circulars really make it difficult to move sts from pin to cord to pin when I use the magic loop technique. Any others have experiences to share with these needles? Are the 10" long sock needles by yarn Cubby better for sock knitting? I suppose with those you just knit around, but how you do really small circumferences on them is not obvious, at least to me, with the cord being too short for magic loop and my loathing of dpns. There's a button on the blog you can take to link to me. I'm glad someone actually tried to use these. Pass for me. I think KnitPicks has that size circular. I ordered 2.75 Inox Premium and Addi Turbo Gold in 2.5 mm yesterday. That's how frustrating it is to knit with them. I am totally sold on the KnitPicks needles. The cables have no memory so they don't twist and the joins are smooth as silk. I got the set with the binder and have added cords and extra needle tips. The tips are nice and pointy. I like these much better than Addi's and they are cheaper. Just MHO! If I ever get the chance to try KnitPicks Options, I'd like to. Doesn't hurt to have more than 1 set in the same size for times when knitter's ADD strikes. 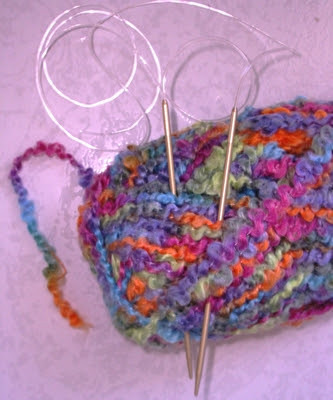 you can knit small circumferences with 2 circular needles, so you still don't need to use DPN's. I have tried using Magic loop but find 2 circs easier to manage.